Today Allison and I exchanged our gifts to one another. Hers completely topped mine, but I’m okay with that…this year. The best thing about this gift is that it was a well thought out gift. You know unlike the non thought out gifts…clothes, underwear, socks, electronics, cookware, etc. Not that those gifts aren’t great to receive, because they are. Get me an iPhone and I’m your best friend. However, this gift just affirmed in my heart more that Allison is someone I want to spend a long time with. It wasn’t something I asked for, or expected at all. It was a gift of her paying attention to me, seeing what I love, and knowing what would make all my insides jittery upon receiving. Notre Dame is a huge passion of mine. Seriously, if you’ve watched a game with me, then you know how intense, stupid, and probably inappropriate I get during. But it’s a passion for me, and she noticed and loves me for it. The debating is over, I’m much better with her in my life. I mean snap, she even colorized the bows accordingly to the school’s colors. she’s a keeper, that’s for sure! 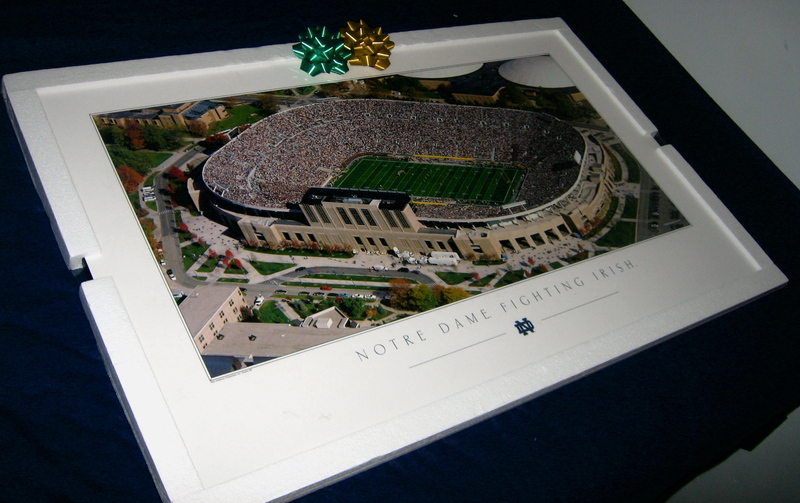 just don’t return the favor by getting her season tickets to ND football, and all will be well…what DID you get her, since you’re sharing? Ok, like I totally dig Allison because I totally feel your excitement about her in each and every single post you do that merely mentions her name. It’s love Kyle. So maybe I’m premature in saying that, but you know I just go all out there regardless of sense. It’s love. Admit it. I’m very happy for you! @candidchatter you are most definitely not premature.